NOTES: Snow level near 5,000 feet. Noticable accumulation 5,500 to 6,000 feet. Three to four inches of moist, new snow sits on top of a deep, isothermal snowpack. Moderate winds were blowing out of the south/southeast and loading westerly aspects. Drifts were observed up to 2 feet deep. Non-planar fractures were possible on wet interfaces with old snow in hand pits. Small wind slabs were triggered on test slopes during hard stomping. Release was slow and progressive. 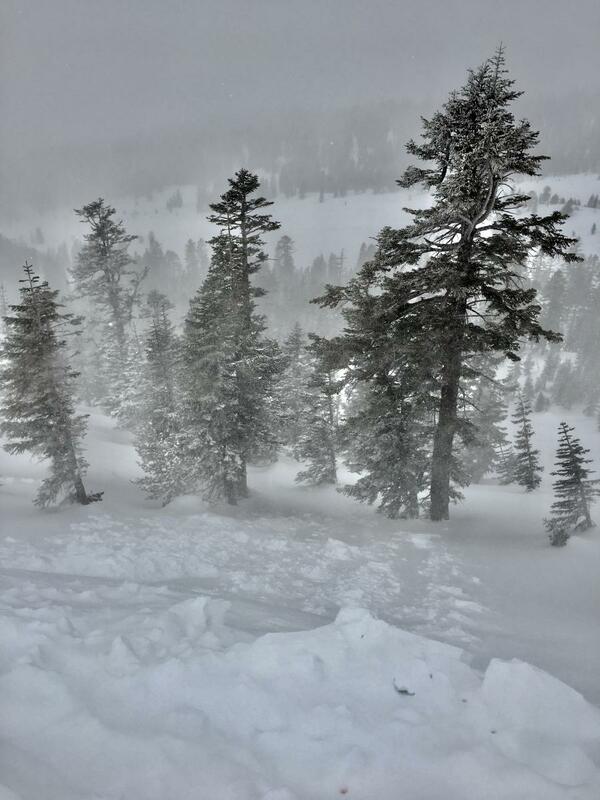 Small, chunky wind slabs were triggered along small test slopes. A fresh breeze (19-24 mi/hr) out of the southeast was loading westerly slopes. A small, wintery storm blew through last night and today, bringing snow levels down to about 5,000 feet and upwards of 3-4 inches of snow above 6,500 feet. The daylight hours hosted cloudy skies, rain in town and snow showers on the mountain. Despite a balmy feel in Mount Shasta City, on the big hill was quite wintery. Snow, wind and low visibility kept most at home. A few folks were shredding up the couple inches of moist refresh. A clearing trend was noticeable as precipitation faded throughout the day and patches of blue sky were visible by late afternoon. No additional new snow accumulation is expected and winds will die off.